Many Add-Ons and tools ! - Detect Repeated Files (cloned files) across any folder structure. Search engine by file's Name, Size or content (data) using CRC32 or MD5. - Rename Files tool is now included, easy and quick mass renamer. - Graphics presentation, with Bar and Pie statistical presentation, detailed scan results summary. - Horizontal/Vertical presentation of results. - New Text Differences: a text file comparator. Analyses two text files and shows an easy to understand and merge information about lines added, modified and deleted. Analyze from Files or Clipboard content. - New Convert Text Files from Unix/Linux <> Windows/DOS formats: allows to convert files to required target format (Unix/DOS) easy. - New Creates Dummy File: Specify file name, desired size (from 0 Bytes) and it creates a "dummy" file with that name and size. - Favorites Folders: easy access of your frequently used folders from the system tray, launch in Explorer or MS-DOS Prompt. - External Software options: users can define external programs to use with Comparator Fast results, easy!. - Integration with WinZip, WinRAR: auto detect these popular compression software to easy access, allowing backups of results on those compressed formats. Users can define their own Zip and Rar software manipulation if WinZip / WinRAR are not installed. 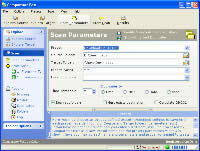 - Save Results to file: allow to save scan results to HTML, Text, Excel, Word, XML or Delimited (CSV). - System Tray option, may start and keep Comparator Fast running on background on Windows system tray. - Recent Used Folders: keep a history of last used folders on Comparator Fast. This history may be used to open those folders quick in Window Explorer or MS-DOS Prompt, just from system tray! - CD/DVD/Removable Media Data Check/Verifier: scan your valuable recorded CD's, CD-RW, DVD, Removable Media (Zip, Jaz, LS, Compact Flash, Smart Media, USB Pen Drives, Tapes Backups -as logical drives-, etc.) or any compatible media, verifying that all the data is readable. If you want to compare, you may use File Comparator too !. - Send selected items (files) to clipboard, but with a pre-processor, allows user to build a command based list of selected files, then copy to clipboard or save to file. - Copy/Move selected files to any folder. - Launch folders in Windows Explorer or MS-DOS Prompt. - Quickly copy selected folders (paths) names and/or file names to clipboard. - Can select all items, none, invert selection, by wildcard, by attributes. - Log management, including Printing, clipboard routines, "Undo" feature, and more. Easy change of files attributes and Date/Times (Modified, Created, Last Accessed). Wizard's like procedures. - Internet Time: synchronize your Computer's clock to be on time, the right time! - Option to get even more speed !